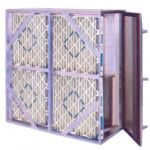 The Advanced Air Handling Equipment side access air filter housing is a permanent housing designed to specifically accommodate ASHRAE rated air filters. Filter efficiencies range anywhere from 30-90% by ASHRAE test method. This 22-¼, 34-¼, 42” or customized depth housing is manufactured with galvanized steel optional 304L stainless steel and is intermittently welded together. All seams are silicone caulked for airtight seal. The unit is a one-piece construction with filter track extrusion permitting either a 2”, 4” or 6” prefilter track and a 1” final filter header track. Each housing is custom manufactured to meet specific end user requirements.